The first series of stakeholder meetings for Landscapes3, being held as part of the #TellUsL3 phase of plan development, are well underway. 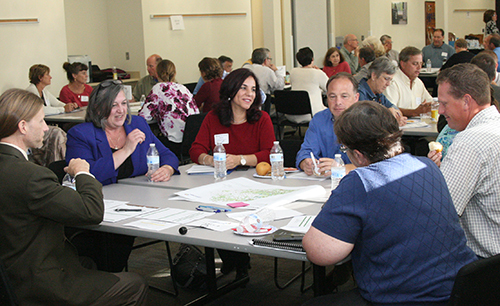 We’ve gathered exceptional teams of people to provide input on the topics of Preservation, Agriculture, and Housing. We’ve also been fortunate to have members of the public join the conversation, both in person and through our topical surveys. Our Preservation Stakeholders Team was pleased to hear about accomplishments in the areas of open space, natural resources, and historic resources, but reminded us of the many tasks that lie ahead. The Agriculture Stakeholders Team celebrated the wealth of agriculture that is found in Chester County, and discussed issues as diverse as agricultural economic development and regulatory requirements. Affordable housing was a hot topic for the Housing Stakeholders Team, as was the need to better connect people between their homes and employment opportunities. Surveys on each of these topics are now available on our website for any interested person to complete, and we’re pleased to report that many have already done so. Surveys will remain open throughout the fall to gather additional input. Up next in our stakeholder process – Utilities and Infrastructure on October 26th and Transportation on November 2nd, with Economic Development and Community Health to follow.